Never in my childhood days did I imagine I’d end up using eyeglasses; I’ve always thought of them as dorky and nerdy. But eventually I needed them when I became myopic, perhaps because of playing video games late at night. I wear my eyeglasses when outside, but not when I work or in front of a computer screen because I feel very dizzy. This condition, called eye strain or asthenopia, can be strong enough to make one feel sick. To learn more about the condition, we invited Dr. Mandy Xu, an eye specialist at Beijing AIER Intech Eye Hospital, to this edition of Doctor’s Corner. What should people wearing eyeglasses (or even those who don’t) do to lessen stress in the eye? – When you look at something without changing your vision for more than 1 hour straight, you definitely need to take some rest. Children should not look at a screen for more than 45 minutes a time. – Keep the distance between the eye and the screen at least 35 cm. – When reading or using electronic products indoors, be sure to turn on the lights, especially if natural light is insufficient. – Young people who are used to looking at their mobile phones before going to bed at night should turn on the lights. How does blinking and/or the use of eye drops help relieve eye fatigue? Dr. Xu: People blink 15-20 times a minute, but with the use of mobile phones, it drops to just 5-10 per minute or less. The decrease in blinking time means the eyelid cannot smear the tear across the surface of the eyeball in time. Tear evaporation will lead to the increase of tear osmotic pressure, dry eye, serious inflammation of the conjunctiva and cornea, and even ulcers. Effective blinking can relieve symptoms to some extent. Eye drops can only play a temporary role in lubrication, but they cannot fundamentally solve the problem of dry eyes. And long-term use of some eye drops can also aggravate the symptoms of dry eyes. Therefore, if dry eyes, fatigue, and other discomfort appear, it is recommended to go to the hospital and take regular treatment under the guidance of doctors. Speaking of going to hospital, can you tell us more about a comprehensive eye exam? Do you recommend it for younger children? 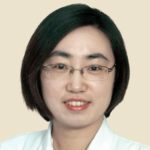 Dr. Xu: With the pace of work and psychological pressure increasing especially nowadays, many young people develop eye diseases earlier they used to a couple of years ago. But for many eye diseases, early detection and timely treatment are key to prognosis. The critical stage of children’s eye development is before 3 years old, and the sensitive period is up to 9. At these stages, it is very important to protect the eyes and treat problems in time. Children’s visual acuity is in a dynamic development process, and screening can find problems such as congenital ophthalmopathy, ametropia, amblyopia, strabismus and other problems. In addition, many eye diseases and systemic diseases are inseparable. For example, some patients with serious diabetes have fundus hemorrhage, a type of diabetic retinal vascular change that can be diagnosed. The causes of early glaucoma can also be found through physical examination. These diseases can cause severe visual impairment, some of which are irreversible. Some people, such as those who live in highland areas; those engaged in driving, sailing, aviation, observation, and other atmospheric environments; or those exposed to intense ultraviolet radiation; or engaged in welding and working under ultraviolet disinfection lamps are at a higher risk of developing a cataract. It is necessary to have a regular ophthalmic examination and fundus examination for patients with hypertension and diabetes. Dr. Mandy Xu is an eye specialist at Aier Eye Hospital and the hospital’s special outpatient doctor. Her expertise includes diagnosis and treatment of common eye diseases. Dr. Xu was awarded a gold medal of Overseas Services by China Youth Volunteers.